While we wrap up the Sydney posts this week, it seems fitting to share our thoughts on how to survive long flights. Our recent trip from Los Angeles to Sydney was 15 hours, and last year's trip to South Africa was another doozy of a flight! So how do you pass the time during the flight and properly function once you land? 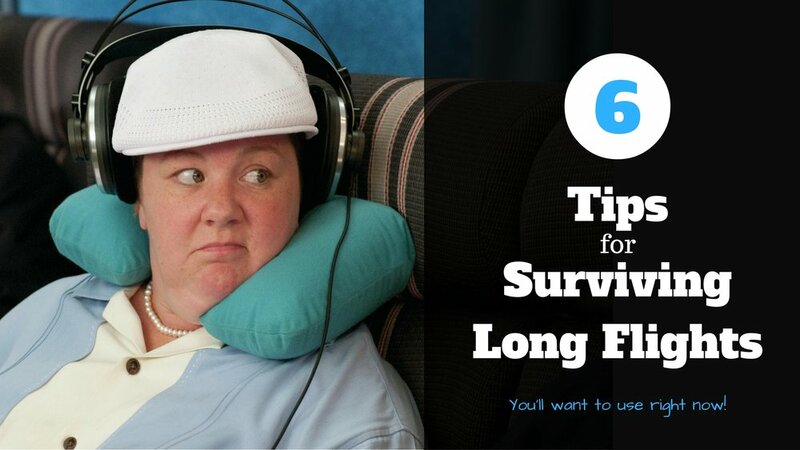 Here are six simple tips you can use for your next long flight! Change the time on your watch/phone to the local time of your destination once you board the plane. The sooner you begin to adjust to the new time zone, the better off you will be. Also, try to eat, sleep, and stay awake as you would at your destination. Drink a lot of water before and during your flight. The cabin's humidity drops to approximately 10-20 percent during flights due to the air filtration systems. Be sure to accept water each and every time the flight attendants come around. Another way to stay hydrated is to lay off the booze. This is easier said than done, especially since most international flights offer free alcoholic-beverages! Alcohol quickly dehydrates you and contrary to popular belief, it does not help you sleep. I limit myself to one glass of red wine during the first round of beverages that are served. When traveling within the U.S., I absolutely judge the people who show up at the airport in their pajamas and sweats. Long haul international flights are another game though. Comfort and layers are essential. My traveling uniform: black yoga pants, cotton v-neck t-shirt, North Face black fleece, and tennis shoes. Ben's go-to are workout shorts, cotton t-shirt, a zip-up hoodie, and tennis shoes. He'd rather be a bit chilly, than hot and sweaty! 15 hours is a long time to be sitting in the same position, so wear something that is comfy, wrinkle free, and dark (in case you spill something...). I bring a pair of thick, wool socks to change into once I'm on the plane. Neck pillow - I splurged on this one for our recent trip and it was worth every penny. Eye Mask - Because, yes, some people do keep their light on the ENTIRE flight. Headphones - Most airlines provide a pair, but they are usually crappy and uncomfortable. We recommend any noise-cancelling headphones. Sanitizing wipes - You'd be surprised how little planes are actually "cleaned." Be sure to wipe down your tray table, arm rests, chairs, and seat buckle, folks! Toiletries - Face wipes, moisturizer (or even this eye-depuffer), deodorant, hand sanitizer, chap stick, tooth brush, and tooth paste. Most airlines offer some sort of TV/Movie/Music entertainment, but it's not a bad idea to bring a few of your own things, as well. To save space and weight, I'll download books, movies, shows, and music all on my iPad/ iPhone, as well as bring 2-3 actual books to read along the way. For Ben, he is a self-proclaimed "film aficionado" and a Sudoku extraordinaire. He will easily knock out 4-5 movies and solve all the puzzles in the back of onboard magazines. When you are not sleeping, walk around the cabin, stretch, and talk to the flight attendants! I'm always so fascinated by my conversations with the flight attendants. They do the long haul flights multiple times a week and have cool stories to share (I envy them)! When all else fails (aka, you look at the monitor and realize you still have EIGHT hours left), close your eyes and picture your destination. It may sound silly, but it works! Let us know the longest flight you've taken and how you kept your sanity in the comment section below!